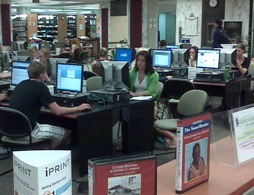 Falvey Memorial Library :: Feedback Friday! The library was bursting with activity this week! Students all over campus were searching for classrooms and meeting old and new friends. Are there any highlights that you’d like to share? Tell us about your first week of school! This is the best first week I’ve had probably. Good professors, nobody is wearing Uggs yet and everything seems somewhat manageable.